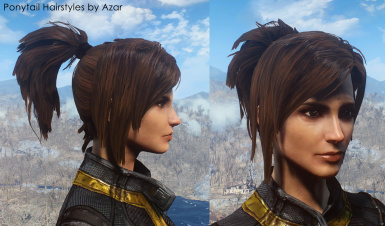 Aim Face Preset For hair, if you don't get it she'll probably be bald. 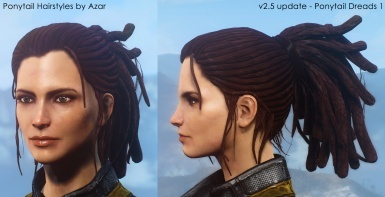 Ciri (The Witcher 3) LooksMenu Preset For Ciri's hair bun. 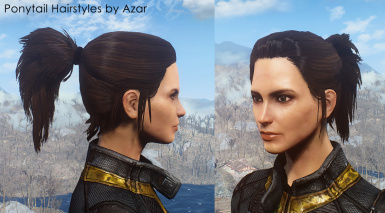 Cute followers - Piper Cait and Curie Hair for Curie and Cait. 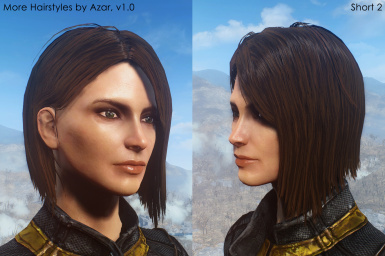 Elsie - My Character body and Face preset. 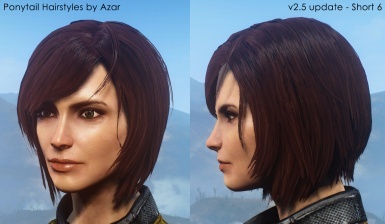 Miranda Lawson Inspired Preset Highly recommended for hairstyle. 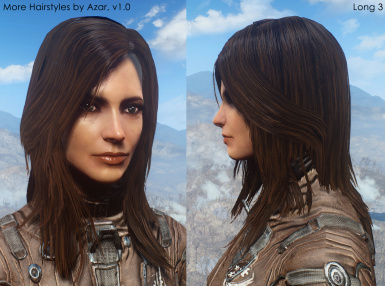 New Hair For You - An Instant Player and Companion Stylist Weapon At least ONE of the featured mods must be installed for NHFY to function. For personal use only. 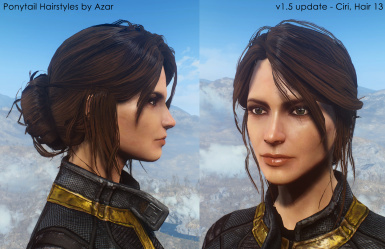 Contact me if you want to use this mod in your mods. 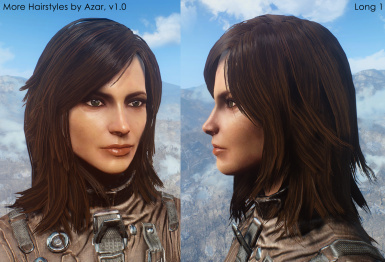 FO4Edit Prerelease Alpha by Zilav. Bethesda Archive Extractor by jonwd7. Fallout 4 by Bethesda Game Studios. 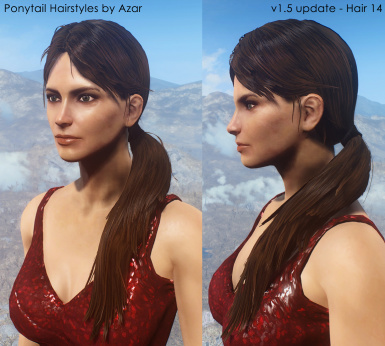 Ponytail Hairstyles originally released in "Ponytail Hairstyles" for Skyrim, by Azar: http://www.nexusmods.com/skyrim/mods/31797/? 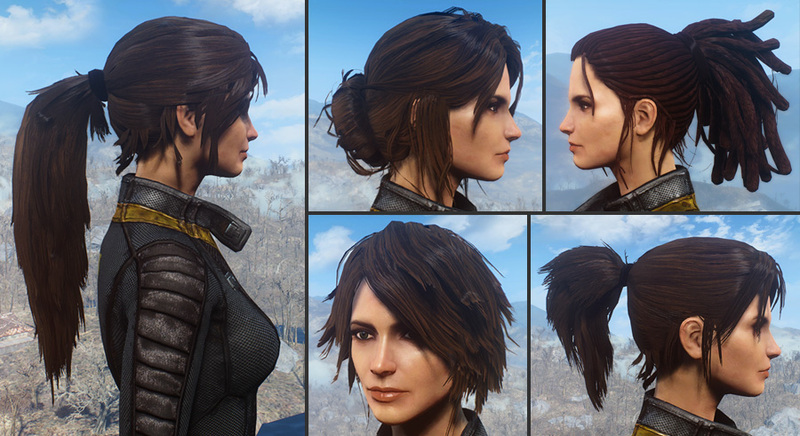 This mod adds 32 new standalone hairstyles for your female characters. 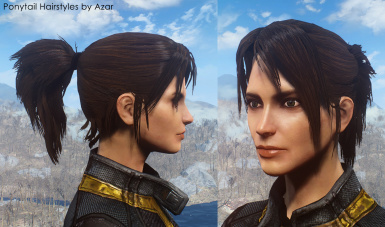 All the hairstyles have been made for Fallout 4 and feature full physics. 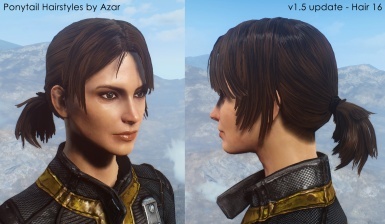 These hairstyles can be used on both males and females, but were designed for females. 1. Download the main file from the files section of this page. Install with either the Nexus Mod Manager, or manually. 2. Nexus mod manager install: After downloading, enable the mod in the mod manager. 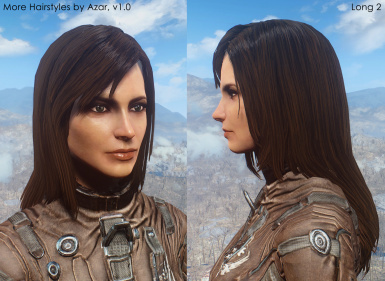 Check that the mod is enabled in "Users\[your user name]\AppData\Local\Fallout4\Plugins.txt". You should see *AzarPonytailHairstyles.esp in the list. 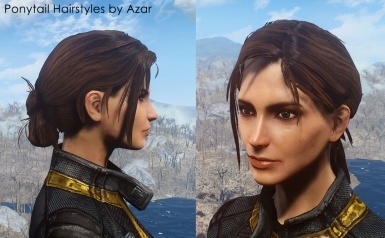 This can also be added to your Fallout4.ini instead of Fallout4Custom.ini. 5. In the game, open the console with the tilde key. Type "slm player 1". 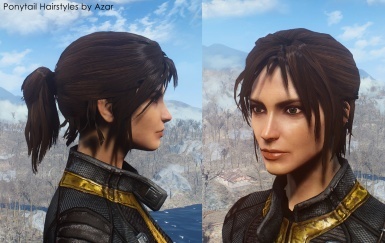 Select the face, then the hair, then your desired hairstyle (i.e. 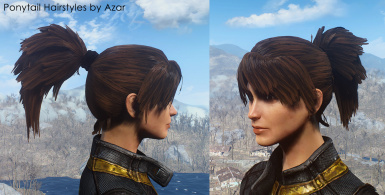 Azar Ponytail 1). Exit out of the menu and you're done. You can also go to a barbershop to choose your hairstyle. - As of Fallout 4 patch 1.5, archive invalidation isn't working. You will need to revert back to the old way of enablinig mods. See step 4 in the installation section. Interface mods may also cause crashes. If that's the case, remove /INTERFACE from the sResourceDataDirsFinal line in the ini file. 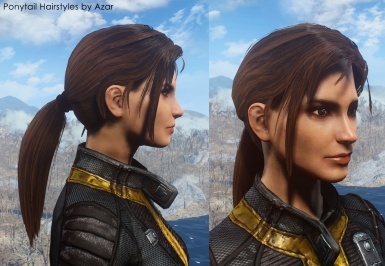 - The physics for the longer ponytails will occasionally glitch out and jump around. This is due to the rig I'm working from, which isn't suited for the longer hairstyles. I will address this in the future. 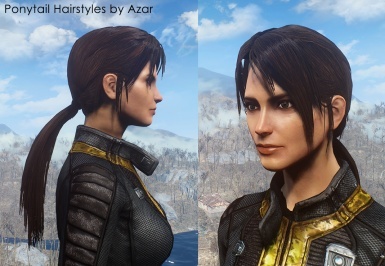 - The hairstyles were not designed for males, but can be used on them. You may experience clipping or other issues. 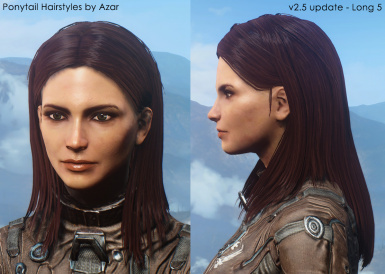 - If your game crashes or you are getting missing hairs, uninstall the mod and reinstall. Set the load order of the ESP to the very last, run the game, go to an empty interior, unequip all of your character's items, and try "slm player 1" again. - Fixes for short 7. 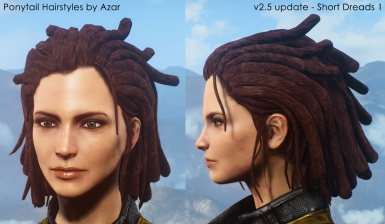 - 5 new hairstyles (2 short hairs, 2 dreadlock hairs, 1 long hair). 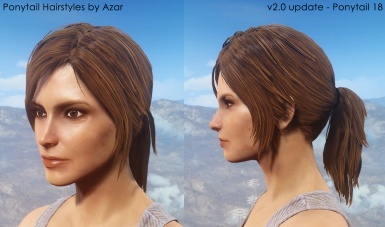 - Fixes for ponytail 12 and 15. - Cleaned up data in all the nif files. 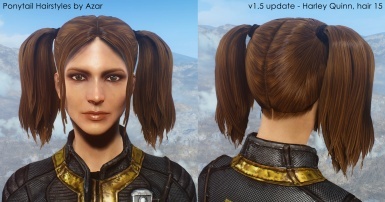 - 6 new hairstyles (3 short hairs, 1 long hair, 2 ponytails). 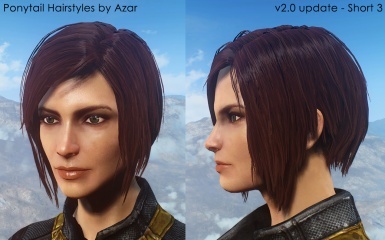 - Fixes for some of the older hairstyles. - ESP has been recreated with the Creation Kit. - Models and textures are packed into BA2 files. 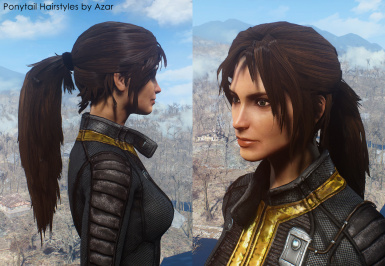 - Merged More Hairstyles into Ponytail Hairstyles. 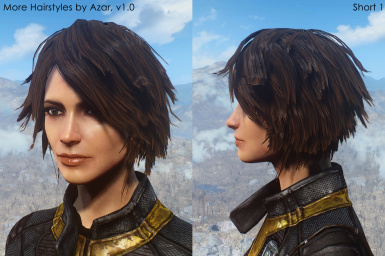 - Initial release, 5 new hairstyles. 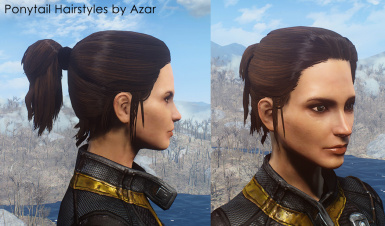 - Fixed hairline for hair 8. 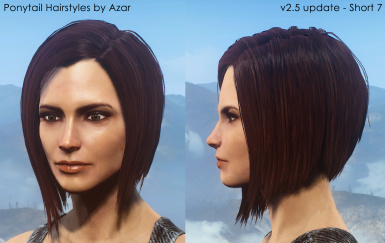 - Changed rig for hair 15 to reduce jitter. 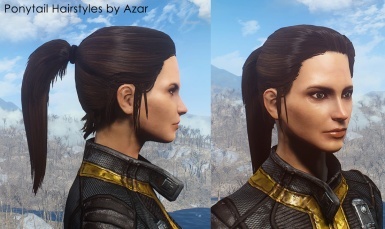 - Fixed hairline for hair 15. - 4 new hairstyles: 13, 14, 15, 16. - Fixes for hairs 1, 2, 5, 6, and 9. - Removed the female only tag from the esp, optional esp no longer needed. 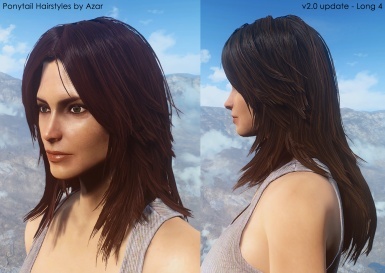 - Repathed the hair color file to the default location. - Pushed the bangs closer to the forehead for all the hairstyles. 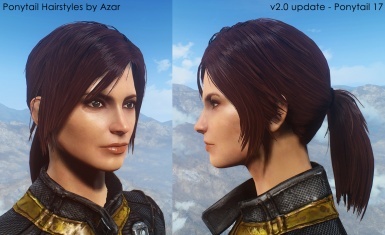 - Hair is now visible when hats or helmets are equipped. - Tightened up Hairstyles 1 and 3. 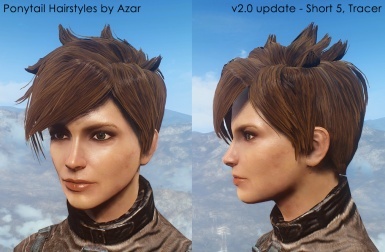 - Fixed skinning on Hairstyle 11. 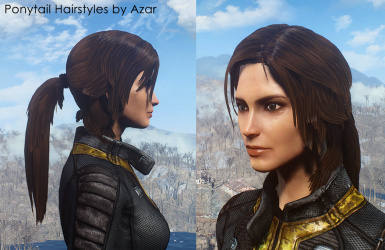 - Initial release, 12 new hairstyles. - Optional ESP for both males and females. For personal use only. Contact me if you want to use any part of this mod in your mods. 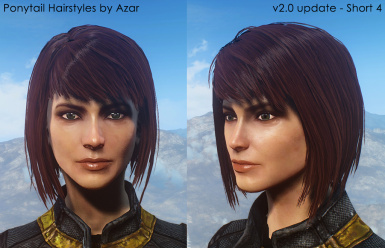 Wearable Shoulder Bag Retextures: http://www.nexusmods.com/fallout4/mods/4986/?